Climb our Gigantic Indoor Rock Wall! Our Indoor Rock Walls are located inside the Sports Connection Family Entertainment Center at our Ballantyne and Northlake locations. You will have your choice of four different climbing stations - each with a unique challenge. Can you make it to the top and sound the siren? Come find out today! The Sports Connection partners with the INNER PEAKS ROCK CLIMBING CENTER located in Charlotte, NC. Open since July 1998, Inner Peaks is the largest, state-of-the-art, full service indoor climbing gym in the Charlotte area. 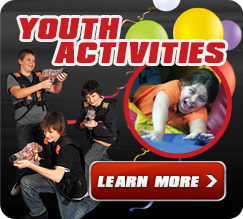 With 13,000 square feet of climbing wall, exciting terrain such as arches, roofs, and cracks, and 50 rope stations, Inner Peaks has something to offer all ages and ability levels. Set goals, improve your risk-taking skills, increase strength, flexibility, endurance and problem solving. Visit their website or call them at (704) 844-6677.